Nose Creek Dental Centre is a family dental office in Airdrie, Alberta. We welcome patients as young as three and offer comprehensive care, including general restorations and aesthetic improvements. Providing the benefits of dental implants to the convenience of CEREC® same day crowns and the Invisalign® orthodontic system, our patients receive the individualized oral health care that they deserve. If you are in need of an emergency dental appointment or have questions about your financial options, we invite you to call our office for more information or email us at ncdc6684@telus.net. Our professional staff will schedule you for an urgent dental care visit, including same day appointments whenever possible. 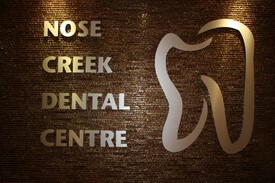 Nose Creek Dental Centre is located off of 1 Ave NW and Edwards Way NW, just east of Nose Creek. Schedule an appointment with our Airdrie dental office by phone or request one online. We welcome new patients and look forward to caring for your smile.